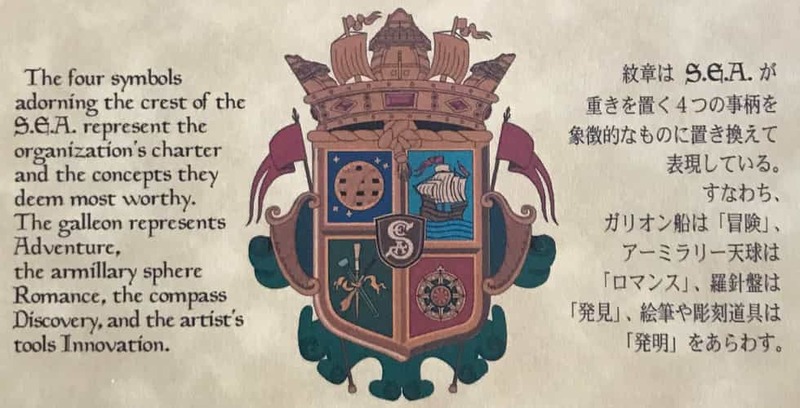 Learn how the Society of Explorers and Adventurers ties together the stories of different Disney attractions from around the world. 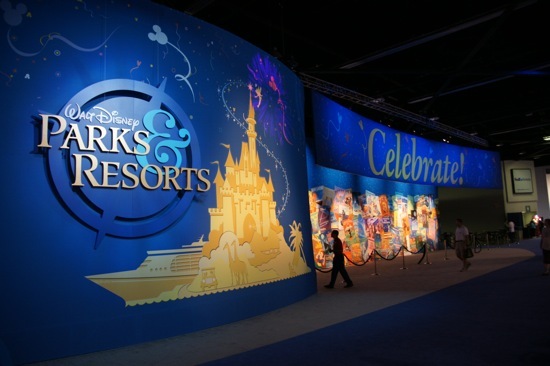 The Walt Disney Park & Resorts exhibit at the D23 Expo is one of the must-see areas of the exhibition floor for any Disney theme park fan. 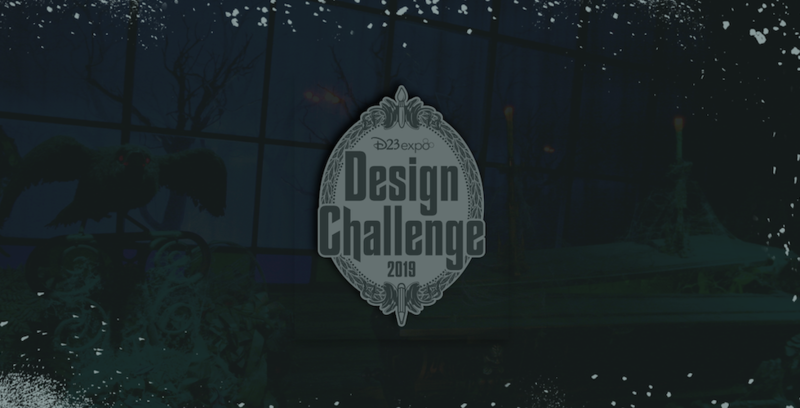 Not only does it feature models, artwork, animatronics, and plenty more from upcoming new attractions but each of the areas is staffed by actual Walt Disney Imagineers who have worked on those projects, eager and ready to tell you all about them. 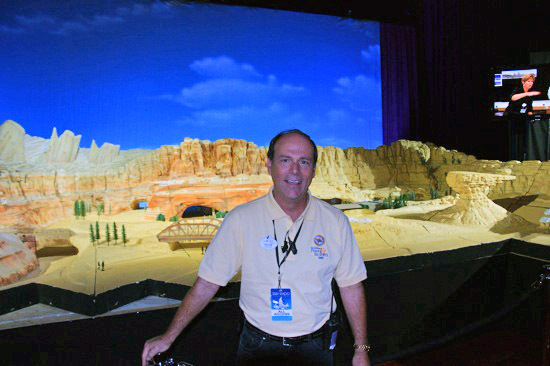 Walt Disney Imagineer Kevin Rafferty was on hand yesterday to tell all about the Radiator Springs Racers attraction coming to Disney’s California Adventure. Whether you’re a fan of the Disney/Pixar film “Cars” or not, it sounds to me like you will love this ride. The roughly 4.5 minute journey will take guests through every element of the film, including a slow drive through the mountains and past a stunning waterfall, a character-filled journey through the town, and culminating in a race against another vehicle over bridges and around tight turns. 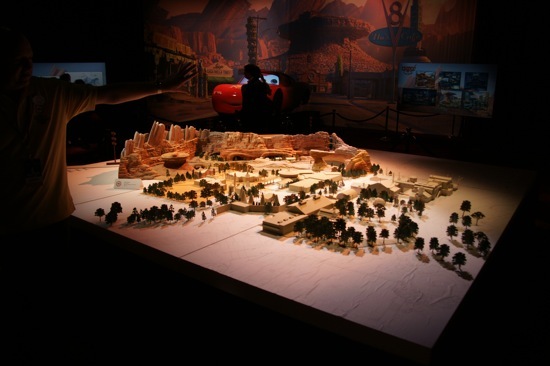 Several models from Cars Land are at the Disney Parks & Resorts exhibit, showing the layout of the entire land as well as details from each of its attractions. 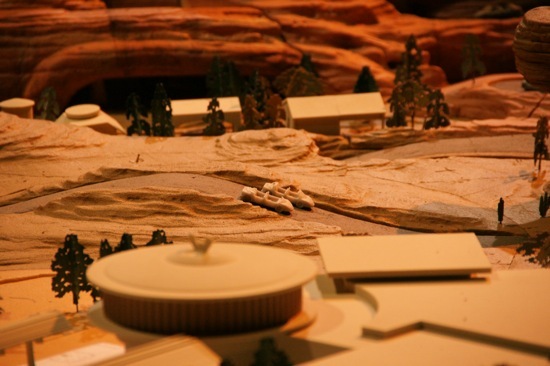 Here’s a close-up of two cars traveling through Radiator Springs Racers. The vehicles will be very similar to those found at Test Track in Epcot but with a modified chassis for a more “Cars”-like styling. The vehicles won’t travel as fast as on Test Track, but they will be paired side-by-side in a race. 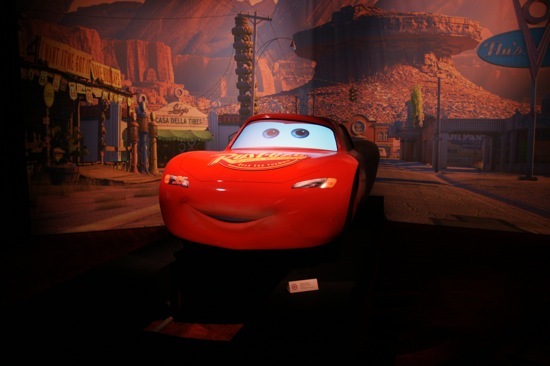 Until the race portion of the ride, the cars will travel individually through the first scenes of the ride. The track will then split off sending guests in opposite directions to prepare for their races. The characters featured in Radiator Springs Racers are lovingly being referred to as “auto-animatronics.” They each feature animated eyes and a mouth that makes the cars really appear to be talking. One particularly fun moment during the ride will be when Mater, the tow truck, pulls out in front of the guests’ car. Since Mater drives always backwards, he will actually be facing guests and talking to them while driving backwards in front of them. 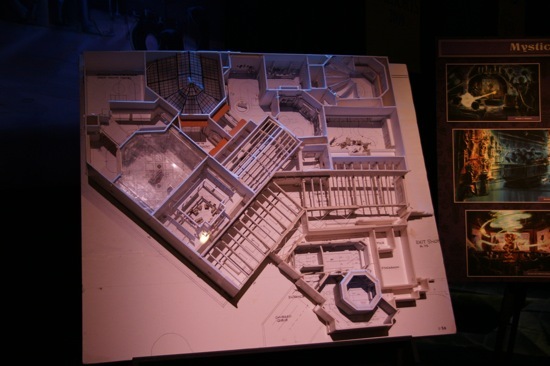 Audio-animatronics is prominently featured within the Disney Parks & Resorts exhibit. 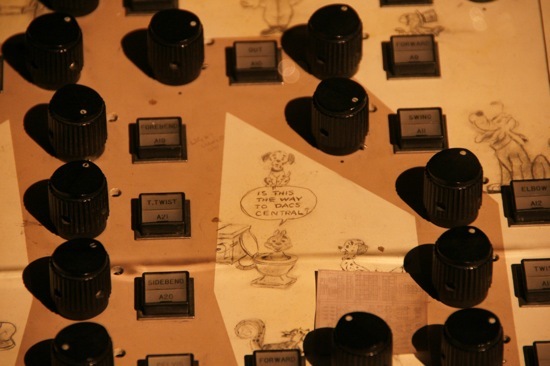 This decades’ old control panel features original sketches drawn directly onto its surface by one of Disney’s animators from the past. 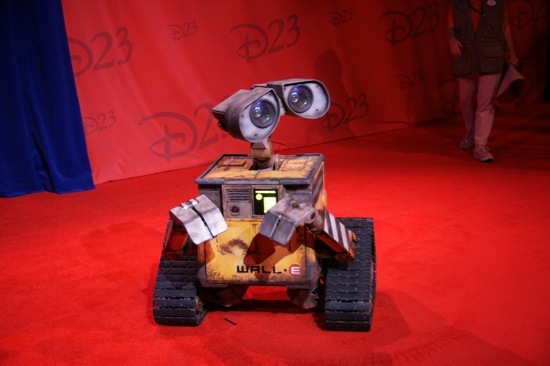 Wall-E made his first public appearance in several months within the Disney Parks & Resorts exhibit. 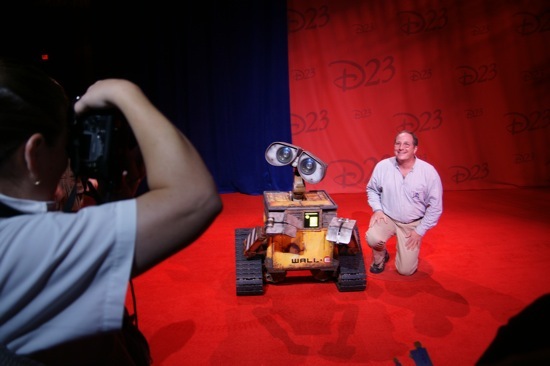 Guests can interact with Wall-E and also get their picture with him. 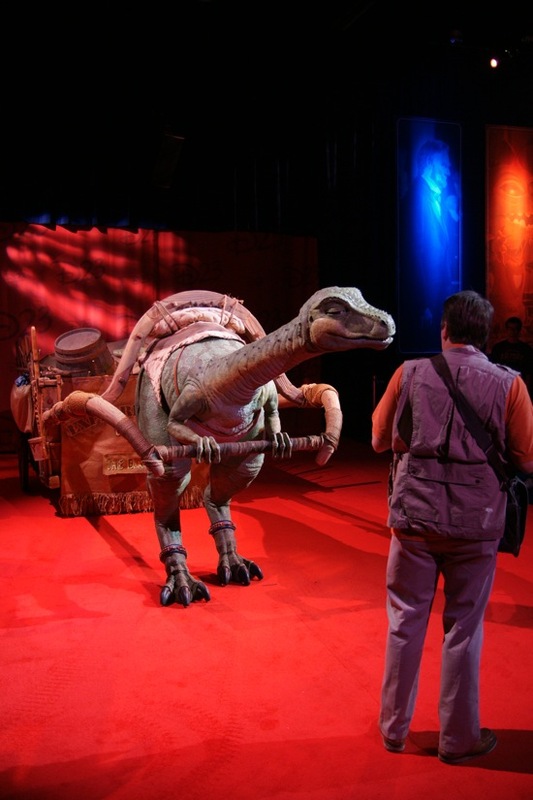 Lucky the Dinosaur also appears at the Disney Parks & Resorts exhibit when Wall-E isn’t around. The final section of the Disney Parks & Resorts exhibit is a huge area devoted to the upcoming Hong Kong Disneyland expansion. 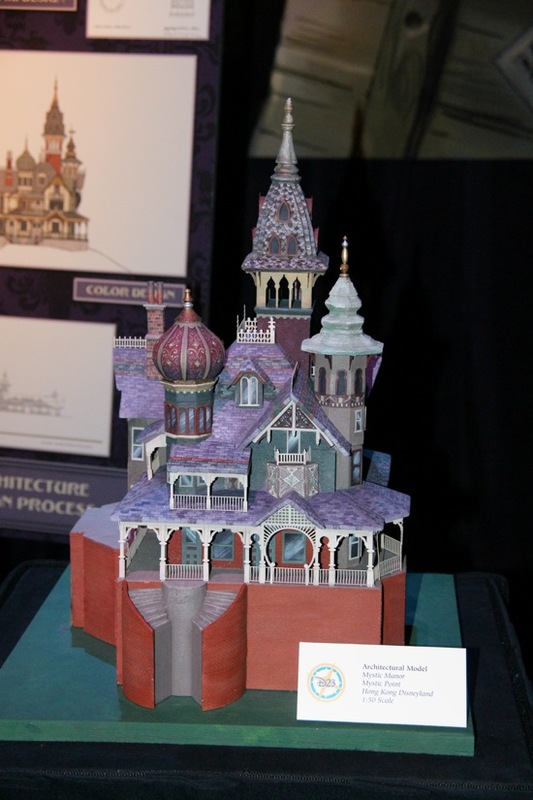 Mystic Manor, pictured above, has a very large portion of the exhibit area, with many different models and concept art walking guests through the entire ride. This full ride layout of Mystic Manor shows how Imagineers take their flat drawings and turn them into a 3-dimensional work to get a sense of how everything flows together. 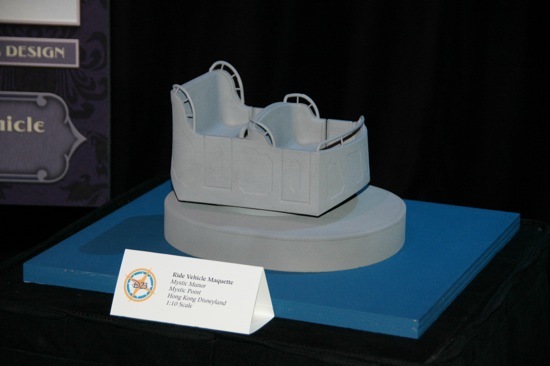 The ride vehicles for Mystic Manor are rather unique and will “float” around the attraction on a trackless system. We will be bringing much more video and photos from the D23 Expo later today so keep checking back! While there hasn’t been any Orlando-specific news or announcements yet, we certainly plan to hear a few at tomorrow’s Walt Disney Parks and Resorts talk.